Photo ball marker made of quality brushed silver, Our personalised photo golf ball markers make the perfect gift for the golfer to take those precious memories onto the course with them. Our photo ball markers measures 2cm diameter and are made from a quality metal with a plug on the back so your photo marker will not blow away on the green. Your photo is coated with Crystal clear transparent gloss polymeric to ensure you receive only a top quality personalised gift and superior high quality artwork. Have any photo you wish on your ball marker, maybe that photo of the children, pets, loved one etc. Each marker is only £2 and are hand made direct from our shop in Northern Ireland and shipped via royal-mail within 1-2 days with postage starting from only £1.15 whatever your quantity. 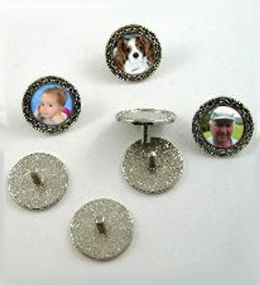 Simply upload your photos below for whatever quantity you require ie (if you are looking for 4 ball markers with different photos simply upload the four photos) add to cart at bottom of page and select quantity at checkout or you can checkout and e-mail your photos to us at sales@yourgiftsourgifts.co.uk .All photos are sent to our secure server as we feel this is the only secure way to protect your images and If there is any problems with your photos we will contact you by e-mail or telephone to discuss your order.